I want to start this topic before new update announced. In 1.26 we get new armor and raised skill cap in Metal but how it was made? We got armor Reinforcement in Hunting and Scepter in Foundrywork. So 1) Only demon bones are usefull and all old bones are useless for anything in armor crafting. Now about Scepter. It was noticed that devs made things that are against Game Lore. We have 3 different tools for metascience that are produced in 3 different branches (Forging | Foundrywork | Woodworking) All other tools have the same branch for regular and runic tools. But really reason of adding scepter to Foundrywork was to make possible skill cap raising in Metal. No other reason exists. So we see update that gave us new things but did it in very strange way. And i also really hope that existing bones will get balance patch soon or any good usage. I think it was a really nice update. 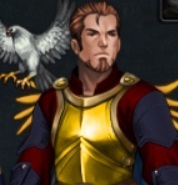 High-End-Players now have something to work for The new armor and the wingu-bow are just awesome Dear devs, job well done! Now we only need 80th runes and a new high-end metall (maybe Grimaldor ). I hope to see one of the things soon. Tuf wrote: But really reason of adding scepter to Foundrywork was to make possible skill cap raising in Metal. No other reason exists. I dont see a problem actualy, there is enough armor for midgame. Yes it CAN be more, but dont NEED to be. So the whole update was about adding one armor. And the only material that is used now are Demon bones. All other materials matters nothing. And all other bones still useless. We got new recipe but for what? Bone's stats are nothing compared to an usual Odi. For me update was to build a palace, im still halfway if not less. And its ok for me to get one good armor as a reward for it. NightCroucher wrote: its ok for me to get one good armor as a reward for it. NightCroucher wrote: For me update was to build a palace, im still halfway if not less. And its ok for me to get one good armor as a reward for it. If follow your logic, there is no need for additional updates, because someone else has not left lanfar.Did i get it right ? "For me update was to build a palace. And its ok for me to get one good armor as a reward for it." NightCroucher wrote: "For me update was to build a palace. And its ok for me to get one good armor as a reward for it." I thought that the topic was not just about you. And its not about my mood. Lack of variety and choice, in part, thats what topic was about.